Happy Thursday! 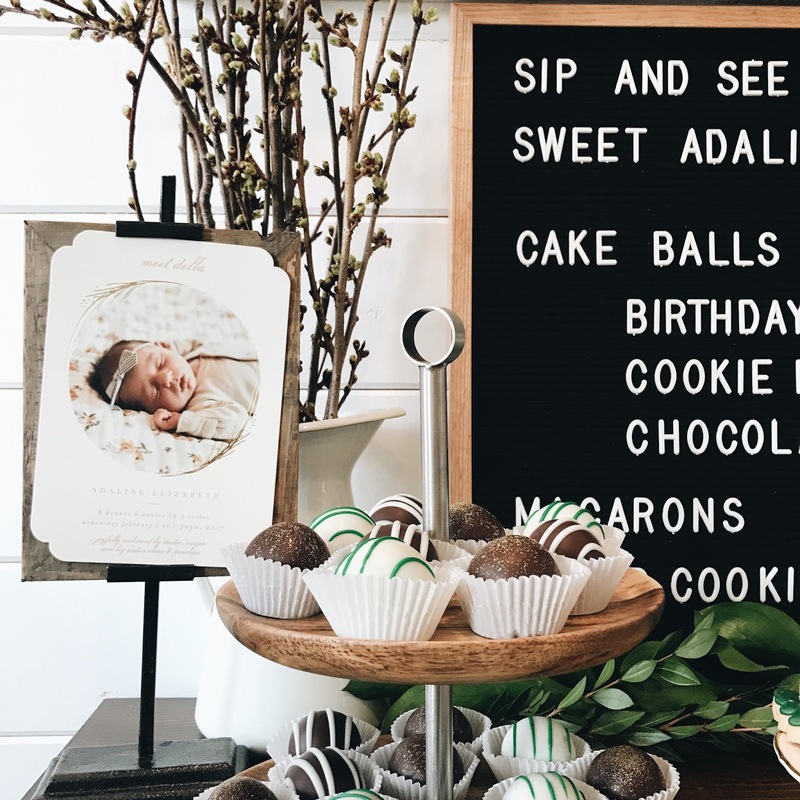 I'm so excited to share a few details about the Sip & See we hosted for Adaline this past weekend for all our friends and family to come meet our newest addition and enjoy some yummy food and drinks. I had so much fun putting it together and pouring my heart into all the tiny details for my baby girl. We hosted a Sip & See for Penelope when she was about this same age, 5-6 weeks, and had such a great time I knew I wanted to do it again with our next baby! The theme for Della's Sip & See was inspired by the very first book I bought for her, You Belong Here by M.H. Clark. I stumbled across it in a tiny boutique early in my pregnancy and the gorgeous cover is what initially caught my eye, but reading it brought me to tears, it is just so sweet. It summed up so beautifully exactly what I felt for our tiny baby girl even before I had met her and since then it has been close to my heart. For the Sip & See, I knew I wanted to incorporate lots of fresh greens and stick with a really natural, neutral palette, with some golds and browns like those prominent in the book's illustrations. I found the perfect invitations from Minted of two birds sitting in a little nest and then chose coordinating birth announcements with gold foil to tie in the colors. And perhaps the best part of it all, other than having our home filled with so many dear friends and family to welcome and celebrate our little girl, was being able to serve the most delicious desserts from Sweet Retreat Cupcake Boutique, located in Edina, MN. 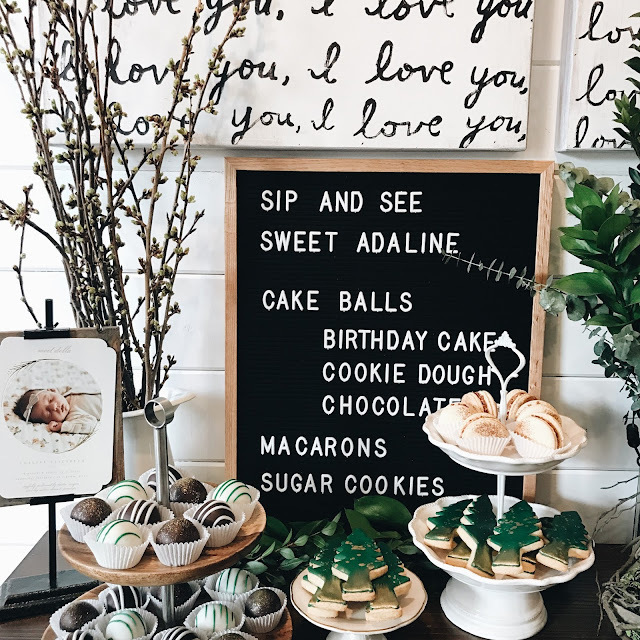 The weekend before Adaline was born, Dustin and I were out with the girls on a lunch date and had the opportunity to try cake balls (think cake pop without the stick!) and couldn't believe how delicious they were. I have never really been a big cake pop fan, as all the ones I've tried have been quite dry and boring. How's that for honesty?! 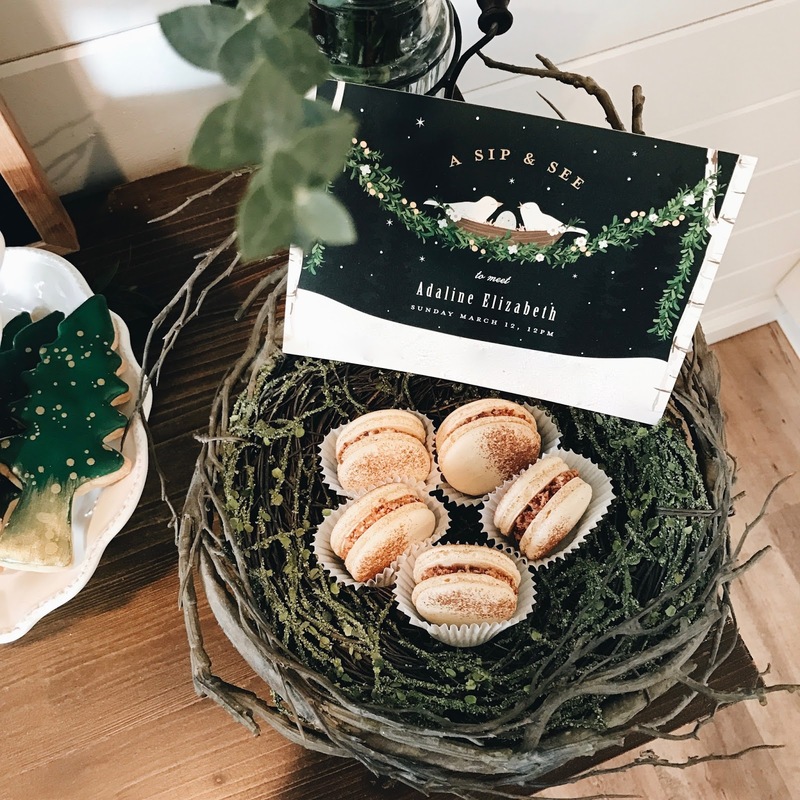 But these were so fresh and full of flavor, I'm pretty sure we ate more than our fair share ;) Of course we had to know where they were from and when we were pointed to Sweet Retreat, I knew they would be the perfect addition to our upcoming party. Everyone at Sweet Retreat was so wonderful to work with, which is exactly what I needed in my sleep deprived state after welcoming a newborn! 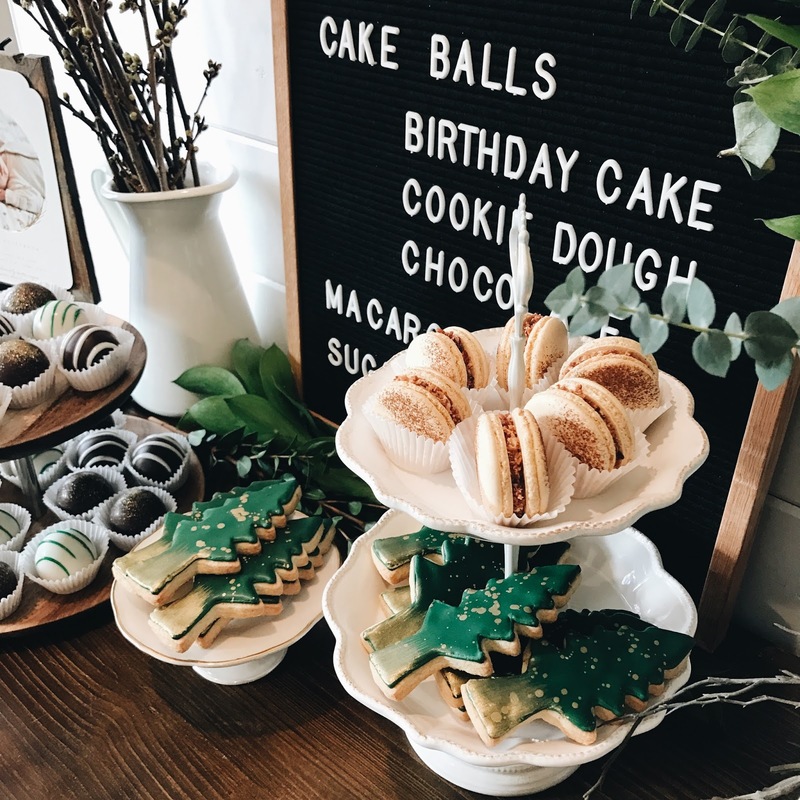 In addition to providing all the cake balls -- in our 3 favorite flavors of birthday cake, cookie dough and chocolate -- they whipped up the most beautiful tree shaped sugar cookies and gold macarons. They decorated the cake balls to match my decor, with edible gold glitter on top of the chocolate ones and green frosting on the birthday cake. In the past for the girls' birthday parties, we've always served full cakes but I loved that these were bite size, didn't require anyone in the kitchen slicing and serving the way a traditional cake does, and were kid-friendly, since so many of our closest friends have young kids, like we do, who were at the party. In addition to their cake balls and cookies, Sweet Retreat makes stunning cakes for all occasions, including weddings, showers, graduations and more and was voted #1 Cupcake in the Twin Cities via City Pages; owner and chef Robin Johnson was also on Cupcake Wars in 2011 featuring her strawberry balsamic cupcake. 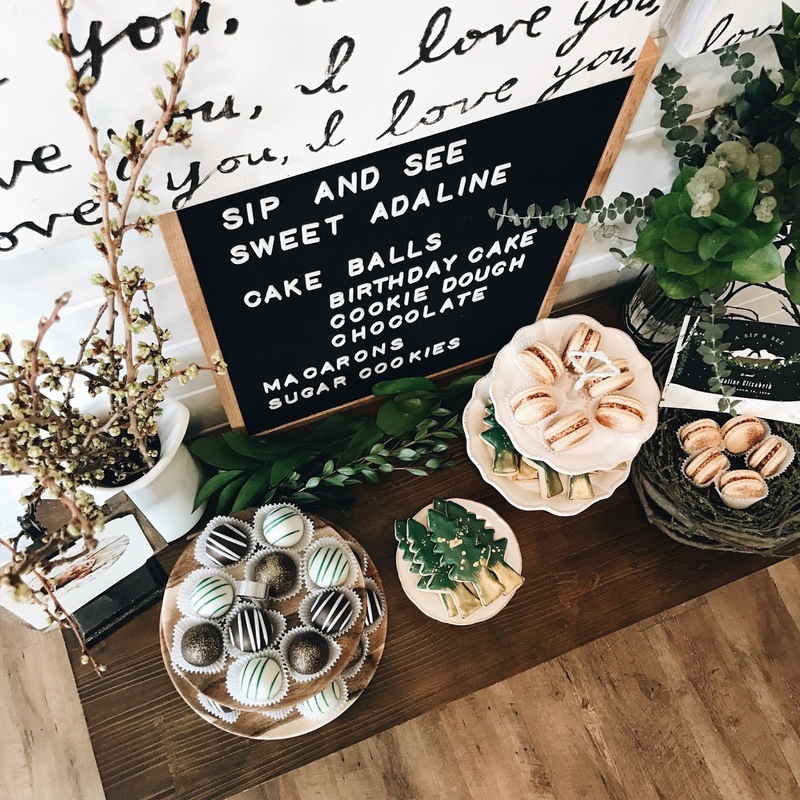 I absolutely love the location of Sweet Retreat, in the heart of Edina off 50th and France, surrounded by so many of our favorite shops and restaurants. 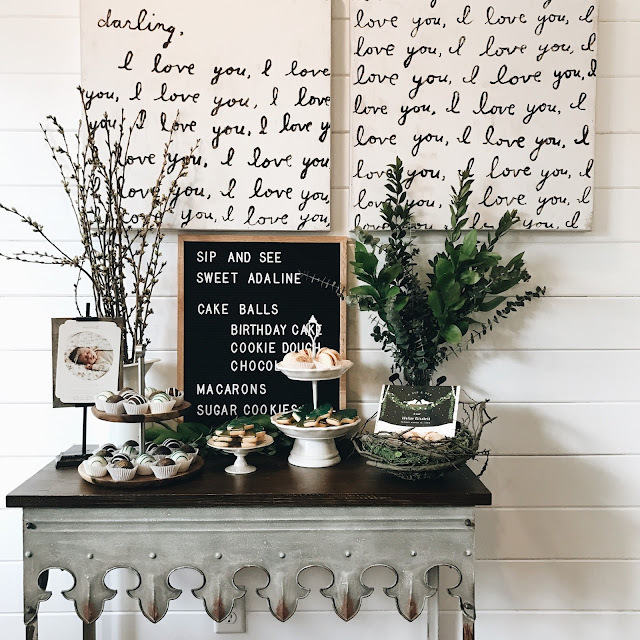 We are looking forward to many more visits as the weather warms with our girls and having Sweet Retreat desserts at all of our upcoming events. Seeing my vision come to life with the decor, food and desserts was so rewarding, and I absolutely love opening our home and entertaining. It just leaves my heart feeling so full at the end of the day. I set the Sip & See up as open-house style, so people were encouraged to stop in anytime it worked well with their schedule throughout the afternoon, grab something to eat and drink, and meet sweet Della. Hosting it this way was absolutely perfect, as it allowed everyone to come at their convenience, work around nap schedules, etc. We had a wonderful turnout and Adaline got lots of love.